In the run-up to a new Headpress book on noise music, I visited the town where the action in my Termite Club chapter took place to measure the current temperature of proceedings there. 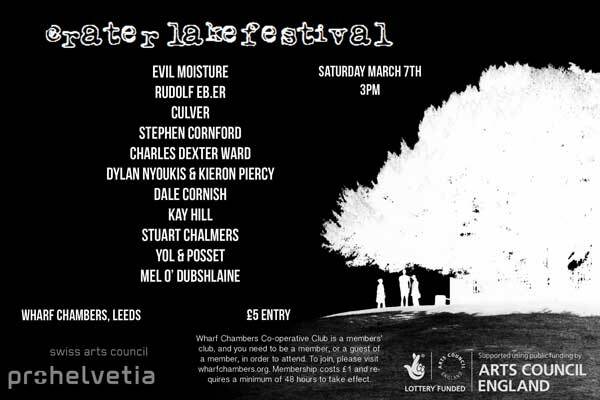 Crater Lake is an annual one-day festival of several years’ standing, staged at the popular Wharf Chambers community co-op, on the south side of Leeds city centre. It is now funded by the Arts Council and alongside the locals and acts from around the UK has reached out for a couple of performers based abroad. The total lack of any rock bands was noted by observers this year, this decision being presumably influenced by funding restrictions. The line-up on the night was in a slightly different order to the one on the flyer. The gig room was darkened rather unnecessarily on what was a delightfully sunny day outside, but even the mid-afternoon saw quite a throng in attendance, emphasizing how firmly Leeds has established its reputation for experimental music. Not by any means every such gig in the city receives this sort of attention, but on this occasion the friendly crowd included practically every scenester from the north as well as a refreshing gender balance and even some children (one particularly small attendee sported ear defenders). Mel O’Dubshlaine’s opening set was in some ways the most intriguing of the day, as she read from texts at length and squonk-crumpled her voice into unaccompanied dubbed-out alien sonics, her actual voice only occasionally breaking through. Things then darted in a different direction towards the end as she was joined by her partner in long-running psych-drone group Ashtray Navigations, Phil Todd, who crashed and dinked on some electronic percussion through a pedal thingum. Not like anything else at all really. Next up was Yol & Posset, who have only come to this writer’s attention more recently. Yol clanked and scraped on the tiled floor, his ranting, strangulated vocals about shopping centres somehow fittingly accompanied by his skinhead, docs and turn-ups and framed by Joe Murray aka Posset’s tape mangle and duet vocals. The piece was quite short, which befitted the spiky, power electronics-reminiscent rush of sounds. Yol spent much of the rest of the day looking wiped out from the experience. As honest and vital as Sleaford Mods, if less easy to decode. Stuart Chalmers had more than a hint of ‘folk horror’ and might be at home on the Folklore Tapes label or playing on Saddleworth Moor. He set the scene with candles in the darkness and samples inviting you to “kiss your partner in the ring” (oh, the humanity!). His sizeable collection of toys included a zither, but most effort went into wanging some walkmen around, in what was shaping up to be a day for the tape revivalists. The thinned crowd grew to the point where he received genuine and warm applause on finishing. Kay Hill’s clanking and atmospherics was the only performance I missed most of. I re-entered to watch Dale Cornish, someone else I have only been becoming aware of recently. There was utter silence for the tinkling initially emitted from his laptop, which finished remarkably quickly to one man clapping, chuckles and onstage banter. Gabbling chatter about suicide then moved into chopped electronic noise and low rumbling, then an Aphex Twin-style section of slurred voices. After this, the bouncing ball techno beats started up, but not such that many were drawn to do more than nod their heads slightly, although it inevitably built to the point of shaking the building before evaporating into nothing again. Dylan Nyoukis started his now well-developed career in the oft-mentioned Prick Decay and has perhaps more recently been most noted for his excellent vocal improv, some of which was the subject of several discussions during the day, being featured in a prestigious current Leeds exhibition with his partner Karen Constance. On this occasion, he took position behind the day’s much-used table with Keiron Piercy from Spoils & Relics, yet another group I am embarrassingly behind on. One of the main attractions of the day and attended by an appropriate proportion of the crowd, tapes and mixing featured again. They slurped unobtrusively into action, building through gurgling watery sounds and ominous voices dipped in a reverb swamp into edgy, distorted confusion and feedback, with some sombre, arpeggiating organ tones overcut with creaking and ripping sounds. It was largely understated but managed to be probably the most emotionally varied set of the day. Notably, one or two of the more serious audience members tutted at loud gassers at the back, which gassing Nyoukis would presumably have no problem with after being similarly chastised at the Termite years ago for talking over an especially quiet performance from his future collaborators, the Bohmans. Charles Dexter Ward is the latest project from the north-east’s Jerome Smith, who has been in many ensembles since the 90s and here delivered humming synth tones and guitar drone, added to by EBow and all delivered through an enormous amp. The cleansing, clearing tones were very welcome. One guy at the front sat on the floor with his head in his hands, hopefully in raptures! I had been wondering all day what the miked-up TV was doing there and this question was answered by Stephen Cornford, who built a stack of the things, transmitting static and flickers and amplifying the resultant microscopic rumbles and pops massively, in easily the day’s most visual piece. At certain points in the past, performance may have been much more prominent at such an event and although it is not by any means essential, it was nice to see someone addressing this side of things after all the table-based set-ups. Opinion on Cornford changed radically depending on where the listeners were sited, with a seemingly average sound on the sidelines turning into something screwy, cat-bothering and ear canal pressure-changing the nearer you got. Some battle-hardened noisers found it difficult to survive. Culver aka Lee Stokoe is another north-east stalwart (and sometime member of Skullflower). 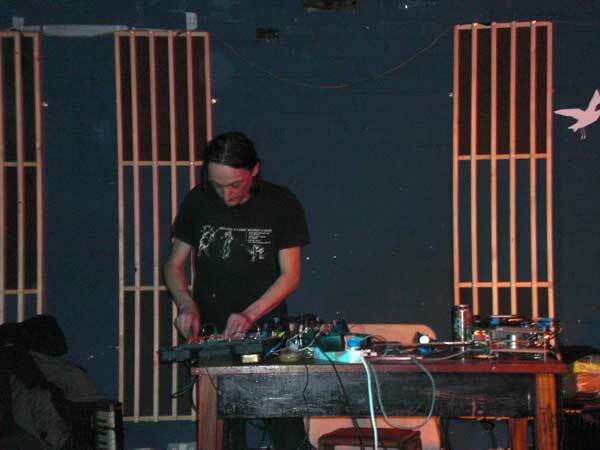 He is sometimes characterised as playing ‘harshdrone’ and his diminutive, floor-sitting bunny rabbit pose was in stark contrast to the granular concrete wall of keyboard drone which filled every crack in the building, tiny details emerging here and there from the throb. It was heavy but soaked up by the bodies in the large crowd, which Stokoe must be proud to have got to the point of drawing. 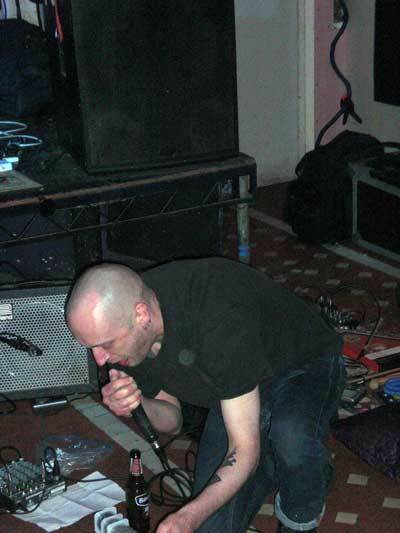 Up to this point, the day had been strangely lacking what one might term a traditional noise act, which was then delivered at gratifying volume by Paris-based ex-pat Andy Bolus’ long-running Evil Moisture project. Old-style trailing tape loops juddered between machines, mixed at one end and forced to new levels of intensity by switch-flicking at the other. The front started to resemble a miniscule moshpit, fists pumping and bodies writhing. Bolus is not the sort of guy to take multiple bows, but as he rushed off to the sidelines, he looked genuinely taken aback by the force of the reaction to what was a long but thoroughly engaging set. Things finished with Rudolf Eb.er from Switzerland’s Schimpfluch-Gruppe. Their Dada-influenced output has moved over the years through a succession of concept-based projects which combine absurd humour with chilling and intense politics. On this occasion, the direct humour was limited mainly to a section wherein he gave himself a mock EST treatment—no-one laughed, perhaps unsurprisingly, and that sums up the territory the group operates in. Most of the rest of the performance saw him sat at a mixer, meticulously working all manner of sample sources together with the skill of a watch-maker. On this occasion, Evil Moisture were an obvious stand-out on a big bill that otherwise rarely caught fire, but while there remains a post-punk confrontational aspect to this area of music, it is largely about ideas and pushing musical boundaries, which god knows we need to keep doing in the era of autotune and the wishy-washiest of lowest common denominator music. On this basis, Crater Lake scored highly.